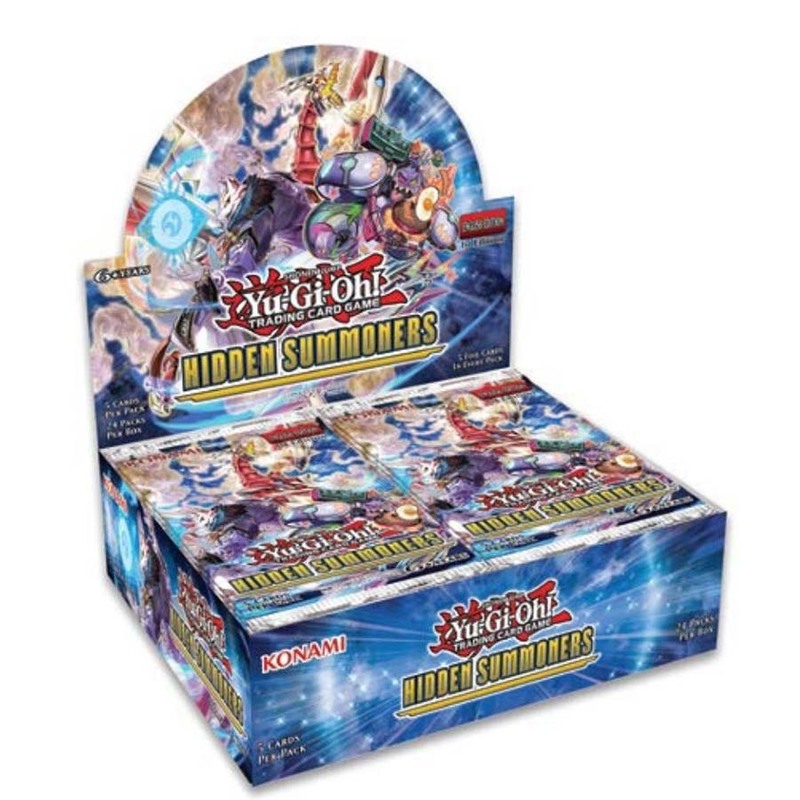 Hidden Summoners is a Booster Pack in the Yu-Gi-Oh! Trading Card Game (TCG). HISU-EN006 "Cerulean Sacred Phoenix of Nephthys"
HISU-EN045 "Phoenix Wing Wind Blast"
HISU-EN047 "Manju of the Ten Thousand Hands"
HISU-EN052 "Fulfillment of the Contract"
HISU-EN055 "Onslaught of the Fire Kings"
HISU-EN056 "Circle of the Fire Kings"
You can only each effect of this card’s name once per turn. (1) You can target 1 Level 4 or lower “Nephthys” monster in your GY, except “Enlightened of Nephthys”; destroy 1 card in your hand, and if you do, Special Summon that monster in Defense Position, but its effects are negated. (2) If this card is destroyed by an effect and sent to the GY, during your Next Standby Phase: You can Special Summon this card from the GY. You can only each effect of this card’s name once per turn. (1) During your Main Phase: You can activate this effect; destroy 1 card in your hand, and if you do, add 1 “Nephthys” monster from your Deck to your hand, except “Prayer of Nephthys”(2) If this card is destroyed by an effect and sent to the GY, during your next Standby Phase: You can activate this effect; add 1 “Nephthys” Spell/Trap Card from your Deck to your hand. You can only each effect of this card’s name once per turn. (1) You can target 1 “Nephthys” card in your GY, except “Speaker of Nephthys”; destroy 1 card in your hand, and if you do, add that target to your hand. (2) If this card is destroyed by an effect and sent to the GY, during your next Standby Phase: You can add 1 “Nephthys” card from your GY to your hand, except “Speaker of Nephthys”. You can only each effect of this card’s name once per turn. (1) During your Main Phase: You can activate this effect; destroy 1 card in your hand, and if you do, Special Summon 1 Level 4 or lower “Nephthys” monster from your hand, except “Protector of Nephthys”. (2) If this card is destroyed by an effect and sent to the GY, during your next Standby Phase: You can activate this effect; Destroy 1 “Nephthys” monster in your Deck, except “Protector of Nephthys”. You can Ritual Summon this card with “Rebirth of Nephthys”. You can only use each effect of this card’s name once per turn. (1) If this card is Ritual Summoned: You can activate this effect; Special Summon 1 “Nephthys” monster from your Deck, but it is destroyed during the End Phase. (2) If this card is in the GY: You can activate this effect; destroy 1 “Nephthys” card in your hand, and if you do, Special Summon this card from the GY. You can Ritual Summon this card with “Rebirth of Nephthys”. You can only use each effect of this card’s name once per turn. (1) During your Main Phase: You can activate this effect; destroy any number of “Nephthys” cards face-up on your side of the field or in your hand, then, destroy an equal number of monsters your opponent controls. (2) If this card is destroyed (by battle or by card effect), during your next Standby Phase: You can Special Summon this card from the GY. (1) If this card is Link Summoned, apply one of the following. • Add 1 Level 8 Winged Beast monster from your Deck to your hand, then you can add 1 Ritual Spell Card from your GY to your hand. • Destroy 1 “Nephthys” monster this card points to, and if you do, Special Summon 1 “Nephthys” monster from your GY with a different name, but its effects are negated. This card can be used to Ritual Summon any “Nephthys” Ritual Monster. (1)You must also Tribute monsters from your hand or field whose total Levels equal or exceed the Level of the Ritual Monster you Ritual Summon. If you Tribute “Avatar of Nephthys” or “Sacred Blue Phoenix of Nephthys” to Ritual Summon, you can destroy 1 card on the field. (1) Target 1 “Nephthys” monster you control and 1 card your opponent controls; destroy those cards. You can only use the 2nd effect of this card’s name once per turn (1) “Nephthys” monsters you control gain 300 ATK. (2) If this face-up card in your Spell & Trap Zone is destroyed by an effect: You can Special Summon 1 “Nephthys” monster from your hand, Deck or GY, but it is destroyed during the End Phase. (1) This card gains the following effect(s) based on the number of Ritual Monsters used as its Link Material. • 1 or more: This card cannot be destroyed by battle. • 2 or more: This card gains 1200 ATK, also it cannot be destroyed by card effects. • 3: This card gains 1200 ATK, also it cannot be targeted by card effects. (2) While this card is in the Extra Monster Zone, your opponent cannot target “Nephthys” monsters in the Main Monster Zone for attacks. (1) If this card is sent to the GY as Fusion or Link Material for a “Prankids” monster: You can send 1 “Prankids” card from your Deck to the GY, except “Prankids Pulse”, then you can Special Summon 1 “Prankids” monster from your hand or Deck in Defense Position, except “Prankids Pulse”. (1) If this card is sent to the GY as Fusion or Link Material for a “Prankids” monster: You can inflict 500 damage to your opponent, then Special Summon 1 “Prankids” monster from your hand or Deck in Defense Position, except “Prankids Lamp”. You can only use the effect of this card’s name once per tur. (1) If this card is sent to the GY as Fusion or Link Material for a “Prankids” monster: You can gain 1000 LP, then Special Summon 1 “Prankids” monster from your hand or Deck in Defense Position, except “Prankids Drop”. You can only use this card name’s (1) and (2) effects once per turn each. (1): If this card is Fusion Summoned: You can activate this effect; for the rest of this turn, have this card lose 1000 ATK, and if you do, it can also attack directly this turn. (2): You can Tribute this card, then target 2 non-Fusion “Prankids” monsters with different names in your GY; Special Summon them, also they cannot attack this turn. You can only use the (2) effect of this card once per turn. (1) If a “Prankids” monster you control attacks, your opponent cannot activate effects until the end of the Damage Step. (2) During your opponent’s turn (Quick Effect): You can tribute this card, then target 2 “Prankids” monsters with different names in your GY, except Fusion Monsters; Special Summon them, but they cannot declare an attack this turn. This card cannot be Special Summoned, except by a Fusion Summon. You can only use the second effect of this card’s name once per turn. (1) (Quick Effect): You can Tribute this card; destroy all monsters your opponent controls. (2) If this card is sent to the GY by your opponent: You can target 1 monster in your GY, except a Fusion Monster; Special Summon that monster. (1) If this card is Link Summoned: You can add 1 “Prankids” Spell/Trap Card from your Deck to your hand. (2) You can Tribute this card, then target 2 “Prankids” cards with different names in your GY, except Link Monsters; add those cards to your hand. You can only use the (2)nd effect of this cards’ name once per turn. (1) “Prankids” monsters this card points to gains 1000 ATK. (2) During your opponent’s turn (Quick Effect): You can tribute this card, then target 2 “Prankids” cards with different names in your GY, except Link Monsters; add them to your hand, also, “Prankids” monsters you control cannot be destroyed by your opponent’s effects this turn. This card cannot be Special Summoned, except by a Link Summon. You can only use the second effect of this card’s name once per turn. (1) (Quick Effect): You can Tribute this card; destroy all Spell/Trap Cards your opponent controls. (2) If this card is sent to the GY by your opponent: You can target 1 card in your GY, except a Link Monster; add that card to your hand. (1) When this card is activated: You can add 1 “Prankids” monster from your Deck to your hand. (2) Once per turn, if you Fusion Summon a “Prankids” Fusion Monster: You can have all monsters you control gain 500 ATK. (3) Once per turn, if you Link Summon a “Prankids” Link Monsters: You can have all monsters your opponent controls lose 500 ATK. You can only use the (1)st and (2)nd effects of this card’s name each once per turn. (1) Discard 1 “Prankids” card from your hand; Special Summon 1 “Prankids Token” (Pyro/FIRE/Level 1/ATK 0/DEF 0), but it cannot be Tributed. (2) During your End Phase: You can target 3 “Prankids” cards in your your GY except “Prankids Prank”; shuffle all 3 into the Deck, then draw 1 card. (1) During either player’s Main Phase: Fusion Summon 1 “Prankids” Fusion Monster from your Extra Deck, using monsters from your hand or field as Fusion Material, but for the rest of this turn you cannot Normal or Special Summon monsters, except “Prankids” monsters. You can only use the (1)st and (2)nd effects of this card’s name each once per turn. (1) During the Main Phase, you can: Immediately after this effect resolves, Link Summon 1 “Prankids” Link Monster using “Prankids” monsters you control as material. (2) When a monster your opponent controls declares an attack: You can banish this card; return any number of “Prankids” cards in your GY to the Deck, and if you do, that attacking monster loses ATK until the end of the turn equal to the number of cards returned times 100. (1) You can only control 1 “Beautiful Mayakashi – Dakki”. (2) When a “Mayakashi” monster is Special Summoned from the Extra Deck to your side of the field while this card is in your GY: You can Special Summon this card from your GY. You cannot Special Summon monsters from the Extra Deck the turn you activate this effect, except “Mayakashi” monsters. (1) You can only control 1 “Poison Mayakashi – Tsukahagi”. (2) If a “Mayakashi” monster except “Poison Mayakashi – Tsukahagi” is destroyed by battle or your opponent’s card effect while this card is in the GY: You can Special Summon this card from your GY, but for the rest of this turn, you cannot Special Summon monsters from the Extra Deck, except “Mayakashi” monsters. You can only use the (1)st effect of this card’s name once per turn. (1) If this card is Normal or Special Summoned: you can Special Summon 1 “Mayakashi” monster from your Deck, except “Winged Mayakashi – Hajun”. (2) You cannot Special Summon monsters from your Extra Deck, except “Mayakashi” monsters. You can only use the first effect of this card’s name. (1) If this card is Normal or Special Summoned: You can target 1 “Mayakashi” monster in your GY, except “Rickshaw Mayakashi – Shafu”; Special Summon that monster in Defense Position, but its effects are negated. (2) You cannot Special Summon monsters from the Extra Deck, except “Mayakashi” monsters. (1) Discard another “Mayakashi” monster from your hand; Special Summon this card from your hand. (2) While this card is in a Monster Zone, you cannot Special Summon monsters from the Extra Deck, except “Mayakashi” monsters. You can only use the (2) and (3) effects of this card’s name once per turn. (1) You can only control 1 “Rickshaw Mayakashi – Oboroguruma”. (2) If a Synchro monster you control whose original Level is 5 is destroyed by battle or by the effect of your opponent, while this card is in the GY: You can banish 1 other Zombie monster from your GY, and if you do, Special Summon this card. (3) If this card is Special Summoned from the GY, you can activate this effect: During this turn, monsters you control cannot be destroyed by battle. You can only use the (2) and (3) effects of this card’s name once per turn. (1) You can only control 1 “Poison Mayakashi – Tsuchigumo”. (2) If a Synchro monster you control whose original Level is 7 is destroyed by battle or by the effect of your opponent, while this card is in the GY: You can banish 1 other Zombie monster from your GY, and if you do, Special Summon this card. (3) If this card is Special Summoned from the GY, you can activate this effect: Send the top 3 cards of each player’s Deck to the GY. You can only use the (2) and (3) effects of this card’s name once per turn. (1) You can only control 1 “Winged Mayakashi – Tengu”. (2) If a Synchro monster you control whose original Level is 9 is destroyed by battle or by the effect of your opponent, while this card is in the GY: You can banish 1 other Zombie monster from your GY, and if you do, Special Summon this card. (3) If this card is Special Summoned from the GY, you can activate this effect: Destroy 1 Spell/Trap Card your opponent controls. You can only use the (2)nd and (3)rd effect of this card’s name once per turn. (1) You can only control 1 “Beautiful Mayakashi – Youko”. (2) If a Synchro Monster you control whose original Level is 11 is destroyed by battle or by your opponent’s effect while this card is in the GY: You can banish 1 other Zombie monster from your GY, then Special Summon this card. (3) If this card is Special Summoned from the GY: You can destroy 1 monster your opponent controls. DBHS-JP036 "Skeleton Mayakashi - Gashadokuro"
You can only use the (2) and (3) effects of this card’s name once per turn. (1) You can only control 1 “Corpse Mayakashi – Gashadokuro”. (2) If a Link Monster you control is destroyed by battle or by the effect of your opponent, while this card is in the GY: You can banish 1 other Zombie monster from your GY, and if you do, Special Summon this card. (3) If this card is Special Summoned from the GY, You can activate this effect: During this turn, this face-up card is unaffected by the effects of other cards. You can only use the (3)rd effect of this card;s name once per turn. (1) You can only control 1 “Icicle Mayakashi – Yukionna”. (2) If this card points to a Synchro Monster, your opponent cannot target this card for an attack. (3) While this card is in a Monster Zone, if a Synchro Monster you control is destroyed (by battle or by card effect): You can target 1 face-up monster on the field; halve that monsters’s AKT and DEF until the end of this turn. (1) Take 1 “Mayakashi” card from your Deck, except “Mayakashi Revolt”, and either add it to your hand or send it to the GY. You can only activate a card with this card’s name once per turn, also you cannot Special Summon monsters from the Extra Deck during the turn in which you activate this card, except “Mayakashi” monsters. (1) Discard 1 card, then target 1 of your “Mayakashi” monsters that is in the GY or banished; Special Summon it, and if you do, it cannot be targeted by your opponent’s effects during this turn.